Salted Caramel Ice Cream – The creamiest ice cream you will ever have! Made with homemade caramel, this custard-based ice cream is super decadent and rich and worth every single calorie. I am struggling to start this post today. Today marks the One-Year Anniversary of the blog so I thought I’d have tons of grateful and emotional things to say. But I don’t even know where to begin! I started this blog again to tap into my passion for food and it’s taken me on an incredible journey. I’ve challenged myself with new recipes (this one being the most challenging, by far! ), embraced new flavors (this one being the most surprising), and learned how to time-manage like a BOSS. It’s not easy feat to bring y’all these recipes each week AND balance my day job. But I love it (and I love you all!) so it’s completely worth it. And on that same note, I want to make sure I thank my husband. With all my extra time spent on running this blog, he’s helped manage the rest of our lives (including the laundry! what a saint!) and has never complained when I had to spend a weekend here and there cooking, shooting, and editing. Nor has he complained about being my number-one taste-tester and sacrificing his body for my treats. I could not have kept this blog up without you, love! It only feels fitting to share the recipe that jump-started my passion for cooking and baking again, and, eventually, this blog. It’s another salted caramel recipe, so please forgive me for posting two in one week. And also forgive me for the one I post next week. I’m on a caramel kick and cannot be stopped! Say hello to the creamiest ice cream you will EVER have. I’m serious…if I took it out of the freezer right this second, I could still easily make a thumbprint into the ice cream. It is reeeeally soft. 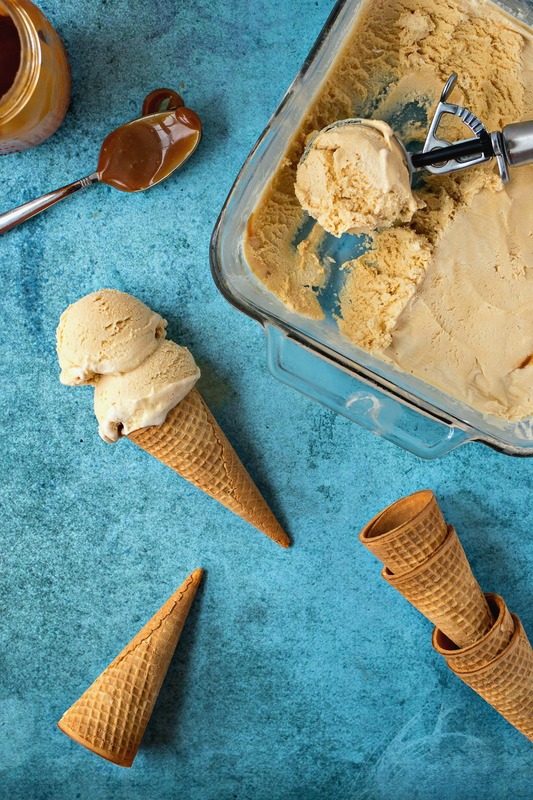 Take a look at this Salted Caramel Ice Cream! I was in a rut for the last couple years – slammed with work and never making time to cook anything meaningful. But then we moved into a new home with my perfect kitchen and it inspired me to get back to it. One thing that I wanted to work on was my ice cream-making skills. I tried making ice cream when I was younger, but it turned into an icy mess that was NOT worth all the effort. I abandoned the thought of ever making my own ice cream again. Why bother when Ben & Jerry’s is basically tapping into my wildest ice cream dreams and creating some of the best combinations of flavors that I’ve ever had? One of my coworkers was raving about the David Lebovitz Salted Caramel Ice Cream recipe so I decided to give that one a try. There were more than a few steps but they all seemed extremely doable, which made the process much less intimidating. The ice cream turned out incredibly well. So super creamy, like gelato, with flavor that was unimaginable. This is what I get when I mix burnt sugar, cream, and butter. I was speechless. I couldn’t believe it was something I made! And it was super easy to follow the steps. If you can read instructions and stir things, you can handle this recipe, without a doubt. Once again, here is a recipe that requires an ice cream machine. But as I said in this sorbet post, I’ve gotten so many uses from this ice cream machine. And it’s the easiest and best way to get the creamiest ice cream that you can imagine. Maybe one day I’ll try out a no-churn recipe, but for now, this is all I know, people. Caramel can quickly go from liquid gold to a burnt mess. So keep stirring constantly throughout the process and remove from heat immediately after it gets to an amber brown color. Make sure that you’ve read the instructions for your ice cream machine before beginning the process. My machine requires me to freeze the bowl for 8 hours before use so I’d hate for you to go through the whole process and then have to wait overnight because you missed a crucial step. This ice cream is actually a custard because it’s made with cream AND egg yolks. The eggs yolks need to be cooked to thicken them up. Because the mixture is warmed up, we need to quickly cool it down to (1) keep it from cooking and getting too thick and (2) to get the chilling process started. We cannot add a warm mixture to the ice cream machine or it will never freeze. This is the reason behind the funny setup in Step 1 of the recipe. Alright people. Before I lead into the recipe, I wanted to thank you for being a reader of this blog. Whether you’ve been a reader from the beginning (Hi Mom!) or this is the first time visiting, I am extremely thankful for you! To show my appreciation, I am hosting my first giveaway! Check out this killer blender from Braun! You could win this! You can enter the giveaway by completing one of the items in the raffle below (or do all 4!). A winner will be selected next week. Raffle is only open to U.S. Residents. Good luck! The creamiest ice cream you will ever have! Made with homemade caramel, this custard-based ice cream is super decadent and rich and worth every single calorie. First, we need to prep the setup for the ice cream. Add about 2 cups of ice to a large bowl so that it is filled 1/3 with ice. Add about 1 cup of water, or until the ice cubes are floating. Place a medium bowl on top of ice water. Add 1 cup of milk and vanilla to the inner bowl and place a mesh strainer on top of inner bowl. Place to the side until Step 7. Place heavy cream into a small saucepan and heat until scolded (you'll see little bubbles begin to form on the edges). Remove from heat and set aside until Step 4. Add all of the sugar to a large saucepan and turn heat to medium. Begin stirring sugar constantly as it heats. It should start melting around 1 1/2 - 2 minutes. Keep stirring. The sugar will begin to darken a little and clump but then it will melt again into a smooth, amber brown liquid. Immediately remove from heat so it doesn't burn. Add butter and salt to sugar and whisk together until butter melts and combines with sugar. Gradually whisk in the cream, about 1/4 cup at a time. The caramel may begin to seize (aka turn hard again). If that's the case, place back on low heat and stir until it melts back into the mixture or the clumps get small enough not to matter. Don't worry - they'll get strained out later. Remove mixture from heat. Stir in other 1 cup of milk. In a separate bowl with the yolks, whisk them together. Add a little (about 1/4 cup) of the caramel-milk mixture to the yolks and whisk together. Add a little more, and whisk together. Yolks should be tempered now and won't scramble when heated. Add them back to the rest of the caramel-milk mixture and stir together. Place mixture back on medium heat so we can thicken the mixture a little. Constantly stir and scrape the bottom. Cook for about 2 minutes or until the mixture is between 160-170 degrees. The mixture should slightly coat the back of a spoon but not be as thick as pudding. It should only be slightly heavier than cream. Pour the mixture through the mesh strainer and into the inner bowl of the setup in Step 1. Stir mixture with the milk and vanilla until it has cooled down. Once room temperature (or cooler), place a piece of plastic wrap directly on top of mixture (to prevent film from forming) and place into the fridge to chill. Should take about 3-4 hours. At this time, freeze a glass or metal container that we'll store the ice cream in later. Once chilled, it is time to make the ice cream. Make ice cream according to machine instructions. Once frozen, you can enjoy ice cream immediately but it might be too soft. Place in frozen container and cover with plastic wrap. Let it freeze until more solid, about 4 hours. Looks delish! I’d like to see recipes for cheesecakes. Any kind! You’re so right – a cheesecake is much-needed here. I’m adding it to the list! Thanks Carolsue! Happy belated Blogiversary! This ice cream looks absolutely delish… Salted caramel gives me life. I would love to see more savory pastries from you; loving you blog and IG feed. Thanks Cyn! I look forward to adding some more savory pastries to my collection this year. Pinned this to use this weekend!!! This is one of my fave flavors and I cannot wait to make it!!! I love salted caramel. It’s tasty with everything! Oh my goodness, this looks delicious! I don’t know why I never thought to try and make my own ice-cream, but now I definitely want to try! Thanks for this recipe! Mmmm, this ice cream recipe looks so tasty! Will definitely have to try it! Yay happy blog anniversary!!! And, YUM YUM YUM to the ice cream! My hubby makes the ice cream in our house (I have never been any good at it!!!) so I will be slipping this delicious recipe under his pillow for him to make me! Haha yess. Let me know if you try it! This looks delicious! And congratulations to you! This is one of my favorite flavors but I have never made it! Totally going to try this! How exciting for your blog’s anniversary! I am a big fan, so happy to see your posts! I love this ice cream recipe, for sure — ice cream might be my favorite food! I reluctantly bought an ice cream maker a few years ago, and it’s nice to put it to use! Thanks! Aw thanks Patricia! That means a lot to hear from you! Congrats on hitting a year! This recipe looks incredible. I would probably eat all of it by myself. Thanks so much! This year FLEW by! Yummmm!! This sounds amazing! I love salted caramel! The ice cream looks so delicious! Yum! I love salted caramel ice cream! My mom would love this so much! I might make this for her because she loves salted caramel! Thanks for sharing! Omg! Salted caramel ice cream is my fave?! I’m excited to try this recipe…it looks so yummy! Can’t imagine being able to make it! Woohoo! Hahaha, I love that you thank your husband for sacrificing his body to be your taste-tester… what a job! Congratulations on your blog anniversary–your photos are gorgeous and your recipes sound delicious! Haha right?! Thanks so much! Sooooo when can I come over??? Seriously – this looks amazing. I lovee all ice cream and this looks amazing. I would love to see a pistachio ice cream or any pistachio dessert in the future on the blog! Awesome giveaway! Yesss! Pistachio is my fave too! I’ve got something coming in September so stay tuned! Congrats! And oh my, this looks amazing!! I’m totally screaming over here. I could lick my screen! Salted caramel is my favorite flavor of ice cream. Your recipe looks so creamy and smooth. I can’t wait to try it. I looked around your site, too. Some awesome recipes there. I entered! Great! Thanks so much for the support! You had me at Caramell! Caramell is my favorite flavor of just about anything. These pictures looks so delicious that is what I want for dessert tonight. This looks amazing! I’ve been thinking about getting an ice cream machine, and here’s even more reason!! I have everything at home to make this, except the machine. Will definitely be saving for later. Perfect! I love my machine and use it so much in the summer. Sorbets are fun to make too! Salted caramel ice cream is ALWAYS my go to at our local ice cream parlor, so I would love to be able to make it at home!! Fingers crossed for this awesome giveaway!!!! Yess! Cannot go wrong with salted caramel! Good luck! Oh wow, this looks so good. Salted caramel is one of my favorite ice cream flavors! I can’t wait to try this. Happy 1 year blogging!! That’s awesome, and so is this icecream recipe! Thanks!! This looks amazing and one of my favorite ice cream flavors! Great for the summer too! This looks amazing. I want some right now! Salted caramel is the best. Oooo peanut butter pie! Love that Idea! I love salted caramel ice cream (and cake, chocolate, pretty much anything salted caramel lol). Thanks for sharing this recipe. And congrats on your 1st blog anniversary! Thanks so much! You’re gonna love next week’s recipe, wink wink! Congratulations on your blog, wishing you may more successful years to come. This salted caramel icecream just had me drooling and I now think I need an icecream machine to be able to make some. Pinning to give it a try, thank you for sharing. Aw thanks so much! I hope you love it! Oh my goodness, why did I have to see this so late at night?! I totally want salted caramel ice-cream right now! I haven’t actually made home-made ice cream before but I feel like with your detailed instructions this is something I could do. I always find the idea of making ice cream very daunting, but this looks too good to miss! Salted caramel is one of my favourite flavours. You included such wonderful photos in this post. Mmm this looks delish! Thanks for sharing. I can’t wait to try! Ok so basically I love all your recipes and this one was the tipping point for me. I am signing up for your email so I can have them delivered straight to my inbox! Jordan! This is the sweetest thing! Thanks so much! You had me at Salted Caramel! It’s my very favorite flavor of icecream! Thanks for sharing your recipe! Ooo thanks for the suggestion! I cannot wait to try it out! Happy Blogiversary! Such an important milestone! The ice cream looks fabulous and your photos…swoon! Thank you so much! Thank means so much to me! This sounds delicious! I’ve never made anything like it. Salted caramel is my absolute favorite flavor! I totally want to make this soon–def saved for later! Perfect for hot weather like we are getting in NYC! WOW! I will so be making this very soon. Salted caramel is one of my faves so keep the caramel recipes coming! this looks so yummy! Plus i entered to win! Yay! Thanks for the support Harmony!